Mouse anti Human von Willebrand Factor antibody, clone RFF-VIII R/2 recognizes human von Willebrand factor (vWF), also known as Factor VIII related antigen, a blood glycoprotein involved in blood coagulation. It stabilises circulating Factor VIII by binding to it and protecting it from cleavage and delivers it to sites of vascular injury. vWF also promotes the adhesion of platelets to sites of vascular damage by forming a molecular bridge between collagen on exposed endothelial cells and the GPIb binding sites of platelets circulating in the blood. vWF circulates in the blood as large multimers, with each monomer (250 kDa) containing a number of specific domains. Hereditary or acquired defects in vWF lead to von Willebrand disease (vWD), characterised by varying degrees of susceptibility to bleeding. Symptoms might include nosebleeds, bleeding gums, easy bruising, menorrrhagia or gastrointestinal bleeding. Various forms of vWD exist with differing severities, determined by the type of defect. Clone RF-VIII R/2 has a high affinity for an epitope within the platelet GPIb-binding site that is responsible for biological activity. As such the antibody is a potent inhibitor of vWF activity. It can completely neutralise ristocetin-induced platelet aggregation, platelet binding to the subendothelium and ristocetin-induced binding of vWF to platelets. It also inhibits platelet adhesion to glass beads. The epitope recognized is present only on the intact multimeric form of vWF and is abolished by mild denaturation with SDS.  The antibody does not recognize human Factor VIII. Mouse anti Human von Willebrand Factor antibody, clone RFF-VIII R/2 may be used to detect vWF in immunoassays in combination with clone Mouse anti Human von Willebrand Factor antibody, clone RFF-VIII R/1 (MCA4682) as a capture reagent. Human Factor VIII complex partially purified from Factor VIII concentrate. Human tonsil, thymus, liver, spleen or kidney. Goodall, A.H. et al. (1985) An immunoradiometric assay for human factor VIII/von Willebrand factor (VIII:vWF) using a monoclonal antibody that defines a functional epitope. Br J Haematol. 59 (4): 565-77. Goodall, A.H. & Meyer, D. (1985) Registry of monoclonal antibodies to factor VIII and von Willebrand factor. International Committee on Thrombosis and Haemostasis. Thromb Haemost. 54 (4): 878-91. Chand, S. et al. (1986) A two-site, monoclonal antibody-based immunoassay for von Willebrand factor--demonstration that vWF function resides in a conformational epitope. Thromb Haemost. 55 (3): 318-24.